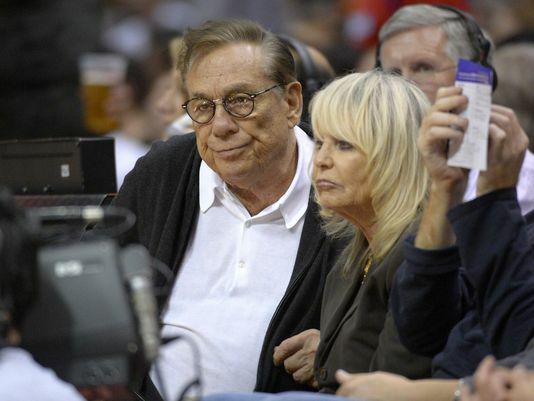 Donald Sterling’s Wife Rochelle with Racist Comments Too? I made the point on a previous blog about how the exclusive NBA owners club had to know about Donald Tokowitz’s Sterling’s progressive views on race relations. His wife since 1955 said she was not a racist. Now the LA Times says she may have spewed a few hateful comments herself. If I had a few billion dollars, I’d look happier. But, I digress. By now you know “The Donald” of the west coast gathered some serious wealth in real estate. Some slums. Some really nice places. He’s “diversified” as they say in financial circles. I’m guessing Darrell didn’t get the cheaper rent. At least she didn’t claim “Shelly” dropped a Latino mother f*****. You know how people begin to look alike after living together for a period of time. I’m guessing the same can be said for progressive views on race relations. ← Hey NBA! What Took So Long? There is surface visceral bigotry and there is enlightened politically-applied ethnocentrism seeking to preserve some measure of Euro-cultural solidarity. What do you want to bet neither Tokowitz ever donated to conservative immigration organizations? Gotta love that cheap labor.